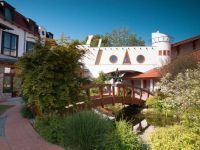 AMBIENT Hotel AromaSpa Sikonda, Komló**** Welcome to the exclusive wellness & spa center and 4-star wellness hotel built on natural thermal springs in the valley of Mecsek Mountains. Sikonda Wellness Hotel *** offers to its guests air conditioned rooms, open-air thermal experience pool, outdoor swimming pool and a covered thermal pool. The hotel’s Wellness Health Centre pampers your body and soul and enhances the vitality of your body and skin. The 3-star Duna Wellness Hotel is located right in the centre of Baja, on the main square of the town. The wellness hotel has 9 suites, 2 apartments and 37 double rooms. In the wellness centre of the hotel fun bath, steam bath, sauna, jacuzzi, massage and fitness room await not only the hotel guests but the local clients too. The restaurant of the hotel offers the typical dishes of the region. Aqua-Spa**** Wellness Apartments await the guests with 10 luxury apartments in Cserkeszolo, famous for its medicinal water. 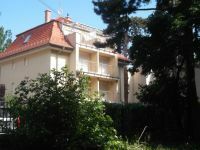 The apartments can accommodate 4+2 guests. The Aqua-Spa**** Wellness and Conference Hotel welcomes the guests with additional 17 double rooms (2 superior category rooms among them where extra bed is available) and 16 bungalows. The wellness department of Aqua-Spa Hotel offers indoor and outdoor pools, experience pool and saunas to make the guests' staying unforgettable. Due to its conference facilities, Wellness and Conference Hotel Aqua-Spa**** ensures a perfect event venue for company programmes, conferences, meetings and weddings. 4-star Hotel Villa Classica of Papa promises comfort and friendly, efficient services a modern traveller may need for work and rest. Each of our 19 rooms is air conditioned. Hotel Villa Classica is an ideal venue of events festive to formal. For our guests we arrange discounted tickets to the thermal bath of Papa where thermal and experience pools, sauna, infra sauna, steam room, jacuzzi, swimming pool and other wellness services are available. 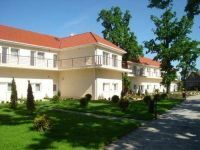 The four-star relic building of Ipoly Residence Hotel is located in the busiest part of Balatonfured, only 50 meters from the shore of Lake Balaton. In accordance with the high quality standards there are 8 suites, 6 premium rooms, a restaurant, a conference room, wellness services (jacuzzi, infrared- and Finnish sauna) and the full-scale infrastructure of Anna Grand Hotel (garage, wellness center, bowling alley, catering facilities) stays at your disposal located 100 meters away from the hotel. 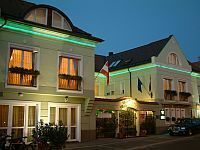 The 3-star Hotel Corvinus is situated in the heart of Zalaszentgrót. The completely renovated hotel welcomes its guests with 16 hotel rooms, a wellness area and conference rooms. For guests who wish to relax we offer the Thermal Bath of Zalaszentgrót, located only 5 kms from the hotel. Hotel guests can take advantage of the hotel’s transit service between the hotel and the spa of Zalaszentgrót.